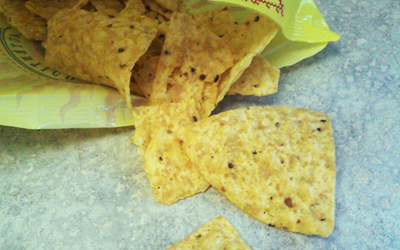 I am quite certain that anyone reading this blog has eaten more than one chip when snacking. I often hear people talk about the slippery slope of thinking that they have about eating junk food. “I’ll just have one” is very popular. It’s a famous lie that takes you down the slippery slope of bad eating habits. If you are working on changing your eating habits, then it’s likely you have experienced some form of the “I’ll just have one” slippery slope. Maybe you ended up eating as much as you normally would have, or more…. “I’ll just have one” turns into the whole bag of chips or cookies, and you end up being frustrated and angry with yourself. This isn’t how you really want to feel. It’s just part of a pattern that needs to be broken. There’s a certain amount of discomfort in the process of change (I’m sure that’s an understatement, too). Guess what? Tomorrow never comes. We are always on today. We live from one breath to the next. Today is this moment in time. Right now. First of all, start with the here and now. When you think about the idea of never eating your favorite food again, or limiting yourself from eating a comfort food that has been your best friend, that can become too overwhelming and scary. Decide on the amount of the food and if you cannot stick to it, or anticipate failure, spend some time thinking about the emotions and negative thoughts that are coming up in your mind and body. When we remove one thing, we need to replace it with another thing. No one wants a crutch replacement. You will want to replace an emotional food with an activity (if you are not hungry) or healthy food (if you are hungry). Pick something that actually meets your needs. Change your physical environment (walk away from the kitchen, for example, and go take the dog for a walk). Make a list of things that you can do so when you are at a loose end, you can read the list and pick something. Music: a song that serves as your personal anthem of success will help you get back on track and remember why you are making the effort. This is a learning experience, not an event. Your mind and body need time to learn, accommodate for new knowledge, and assimilate it into an understanding of yourself and the mental map of how you live your life. Think about how you felt, and reflect on what you learned. Also, realize that you survived the discomfort of change. You might even learn that it actually felt great to conquer that fear and move forward! by Diana Zilly, MS, MA, LCPC, NBCFCH. Diana is a Licensed Clinical Professional Counselor, Fellow in Clinical Hypnotherapy, and former Adjunct Professor of Psychology at Joliet Junior College.